Partick Thistle have decided to pay out a goal bonus to Kris Doolan despite the striker’s “ghost strike” against Morton being missed by the match officials. Footage of the Jags hitman’s second-half effort not just crossing the line but actually hitting the back of the net has gone viral since referee Barry Cook’s blunder on Saturday. The clip has so far racked up more than 1.5million views on social media and now Thistle chiefs have decided to reward Doolan. The Maryhill outfit insist the forward - who is still waiting for his first ‘official’ goal of the new season - did “everything right and deserves the credit for what would appear to be a perfectly legitimate goal”. Doolan has now decided to donate his bonus to the club’s charity partner, the Beatson Cancer Charity. He told the Thistle website: “Saturday was absolutely bizarre and having watched it back a few times I still can’t understand what the officials have seen to disallow it. “It isn’t about the money for me and I just want to do everything I can to help the club get back to the Ladbrokes Premiership. Having not scored so far this season I was desperate to get off the mark and thought I’d done that when the ball hit the back of the net on Saturday. “When Gerry Britton contacted me on Monday morning to tell me the club was paying my bonus I knew I wanted to give it to charity - the goal wasn’t given after all. Thistle - who won Saturday’s Championship clash 1-0 - are still waiting for a response from the Scottish Football Association after writing to Hampden chiefs to demand an explanation on why the goal was not awarded. 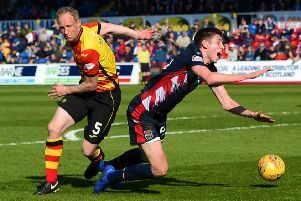 Jags boss Alan Archibald added: “It’s easy for me to talk about it now because we still won the game but a decision of that magnitude could have cost us points. At the end of the day, even though we finished with the victory we had two players booked as a result of the decision, and in a league this tight goal difference could come into play by the time we’re done. “One of the most disappointing things for me though, is that we have heard nothing from the Scottish FA or the match referee since Saturday. As managers we sit in meetings every season with the association and the referees department where they talk about being open and communicating about decisions and rules but that conversation has to work both ways.